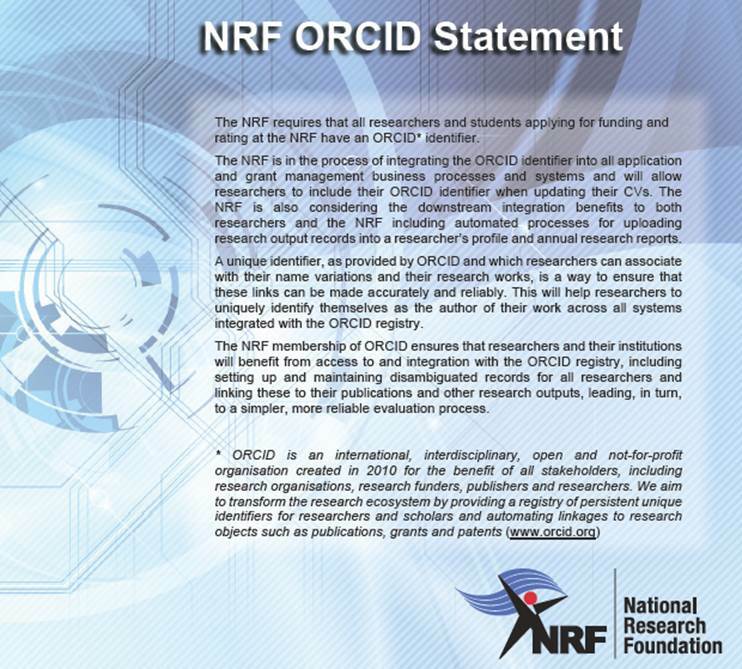 Just a follow-up: register an individual profile free of charge at https://orcid.org/register . Add your ORCID to your email signature and more. Also see the list of 12 SA Member Organisations<https://orcid.org/members>. ASSAf is an official ORCID Ambassador, advocating for the use of ORCIDs in the Africa region. To view this discussion on the web, visit https://groups.google.com/d/msgid/heligliasa/A3995AC971AA9047A7B5B53C388E103F03D321B43035%40EDISON.assaf.local<https://groups.google.com/d/msgid/heligliasa/A3995AC971AA9047A7B5B53C388E103F03D321B43035%40EDISON.assaf.local?utm_medium=email&utm_source=footer>.